Fermentation and maceration in stainless steel tanks at a controlled temperature of 24°C-27°C (75.2°-80.6°F) with 14-16 days of skin contact. After racking and malolactic fermentation in steel tanks, the wine is aged for 21 months in French oak barriques and tonneaux (20% new). 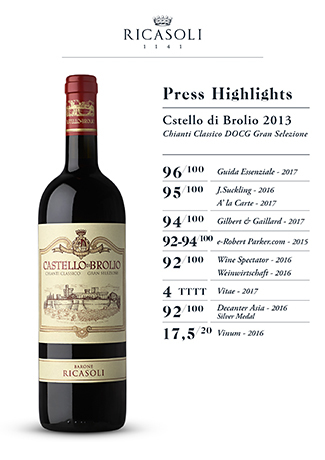 Castello di Brolio is created from a meticulous selection of the best Sangiovese, Cabernet Sauvignon and petit Verdot grapes from the estate’s vineyards, spread over 230 hectares of land. The production of each vintage may thus vary in quantity, but quality is always outstanding. The vineyards are at 250 to 450 meters above sea level, facing south/south-west. The perfect exposure and excellent elevation of the land as well as the very stony soil are responsible for the typicality of this wine. To sum up, a quality harvest with healthy, perfectly ripe grapes. The 2013 Sangiovese offers deep color and a remarkable structure; Cabernet an impenetrable color with a surprising aromatic framework; the petit Verdot gives a velvety roundness to Sangiovese. The palate is full and rich with soft, velvety tannins. The after-smell is generously persistent. 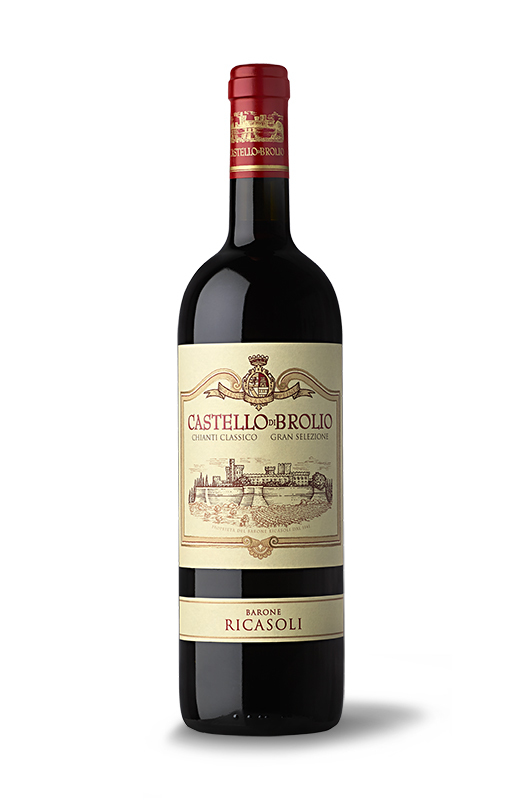 The most authentic expression of the terroir of “Brolio”.